If you are one of those folks (I’m not) who believe that the highest point in aesthetics was attained in the art of ancient Greece and Rome, then you probably do consider the period after the downfall of the Roman Empire, roughly 500–1000 CE, the “Dark Ages.” I don’t, because art did not cease to exist, but actually flourished. Besides, I can cite you (and I have in previous posts) numerous cultures that flourished aesthetically at the same time all over the planet. I believe these cultures achieved as equal a level of sophistication in their arts as ancient Greece and Rome. I’m talking here about the indigenous cultures of the ancient Western Hemisphere, Peru in particular. I’m particularly interested in the Wari culture, which doesn’t get as much attention as the later Inka. The Wari culture developed in the Ayacucho mountain valley in central Peru. It flourished between 500 and 1000 CE, same as the Tiawanaku culture of Bolivia, a culture that influenced Wari art forms. The culture is named after its major city, from which Wari influence spread out over much of central and south Peru. The Wari culture extended its influence through conquest and was probably the first centralized Andean government, which became the basis of the Inka culture. 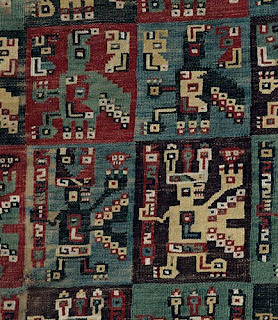 The Wari produced some of the most tightly woven textiles among the Andean cultures, famous for the importance of their textile arts. Wari textiles often contained 200 threads per 2.54 centimeters (1 inch). Like the Tiawanaku culture, Wari textile artists used an interlocked tapestry technique which ultimately was one of the most prized skills among later Inka artists. 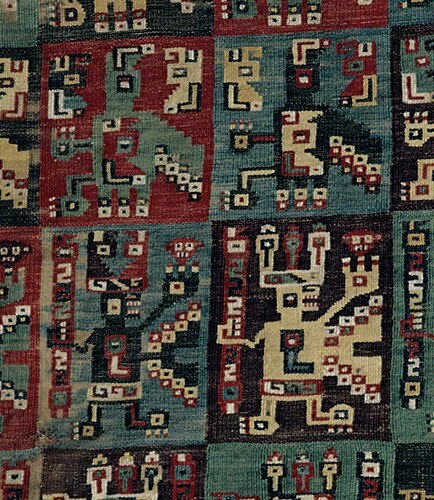 Like the Inka, the capitals of the Wari and Tiawanaku cultures were centered in the Andean highlands where the humidity and seasonal rains allowed few textiles to survive. Desert conditions along the Pacific coast and inland river valleys preserved many of the textiles now found in museums. 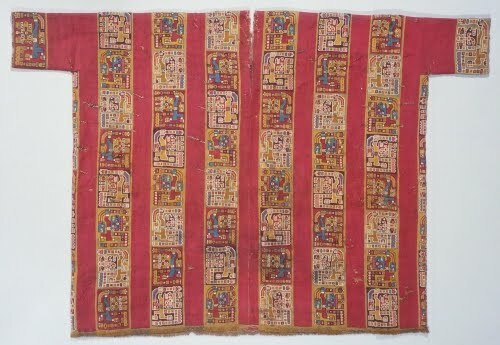 The sophisticated and complex weaving of tunics such as this example marked it as a garment meant only for the ruling class or dignitaries. The weaving is so tight, and the thread count so high, that tunics of this size could often contain as much as nineteen miles (30.77 kilometers) of thread! 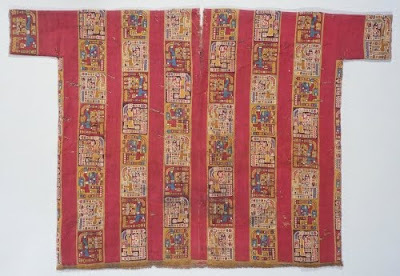 The square construction with a slit opening at the neck is typical of the tunics that ultimately influenced Inka textiles artists, and, too were worn only by the elite. It is no wonder that such sophisticated textiles were prized above gold as a status symbol. This tunic has a repeated motif of a winged being holding a staff and wearing a feathered headdress. Like most Wari textiles, the forms consist of bold geometric simplification. Most Andean textiles have a vertical cotton warp with a cotton and camelid weft. Camelid fibers are the wool from alpacas, llamas, or vicuñas. This fragment bears a repeated motif of stylized camelid figures. If part of a garment, it was most likely worn by a male. The textiles for the ruling class were so sophisticated, that it is probable that fine textile production was overseen as an art form by the religious/ruling class in the form of a special guild. 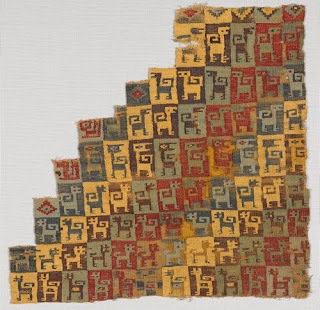 Stylized, actually abstracted, supernatural beings are a staple of subject matter among Andean textile artists. This particular material probably depicts a being called “The Sacrificer,” symbolized by the trophy head held aloft by the figure's left hand. The figures in these panels progress from highly stylized/abstracted figures to figures reduced almost solely to geometric shapes.